Divorce is tough for everyone involved, but it can be especially devastating for children. Ultimately, how children are affected depends on how parents conduct themselves during this trying time. Written by a psychologist and child custody expert, this book coaches you on what to expect during divorce, and how to act in your children's best interest. "Does Wednesday Mean Mom's House or Dad's?" 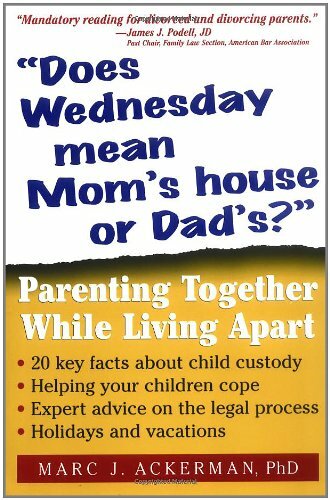 won't tell you how to "win" custody battles (a contest nobody ever really wins), but it will show you how to work with your spouse in order to effectively parent together while living apart. Dr. Ackerman coaches you on every aspect of the divorce, custody, and co-parenting process. You'll learn how to help your children deal with their feelings about the divorce, and handle the changes in their lives. 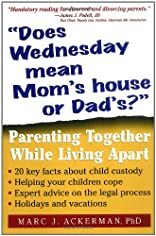 You'll also get a wealth of practical information on what to expect in the legal process, the ins and outs of various custody arrangements and visitation plans, and how to avoid the pitfalls of parenting from a distance.